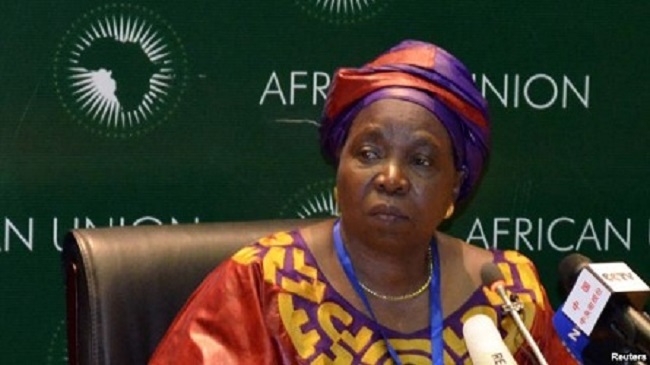 African Union Commission Chairperson Dr. Nkosazana Dlamini- Zuma at the head of a 14-member delegation is expected to arrive in Liberia on Thursday for a one-day official visit. Dr. Dlamini-Zuma’s visit to Liberia is part of her tour of the three countries worst affected by the Ebola Virus Disease. The Executive Secretary of the Economic Commission of Africa (ECA) Dr. Carlos Lopes is accompanying her on a visit that will take the delegation to Sierra Leone and Guinea. The AU Chairperson will meet with Liberian President Ellen Johnson Sirleaf and other senior officials. Dr. Dlamini-Zuma will also meet with UNMIL Chief Karin Landgren, the Special Representative of the UN Secretary General on Ebola Anthony Branbury and members of the National Ebola Task Force, among others. The visit by Dr. Zuma is to show solidarity and support for the efforts of Liberia in trying to contain the Ebola pandemic and to discuss the African Union’s comprehensive efforts, currently ongoing, to combat the Ebola virus. AU already has already deployed a 36-member team of medical personnel to assist with the fight against Ebola under the African Union Support to Ebola Outbreak Operations in West Africa (ASEOWA). The AU Chairperson will use her visit to assess the operations of the team and determine the possibility of scaling up the AU presence in Liberia.